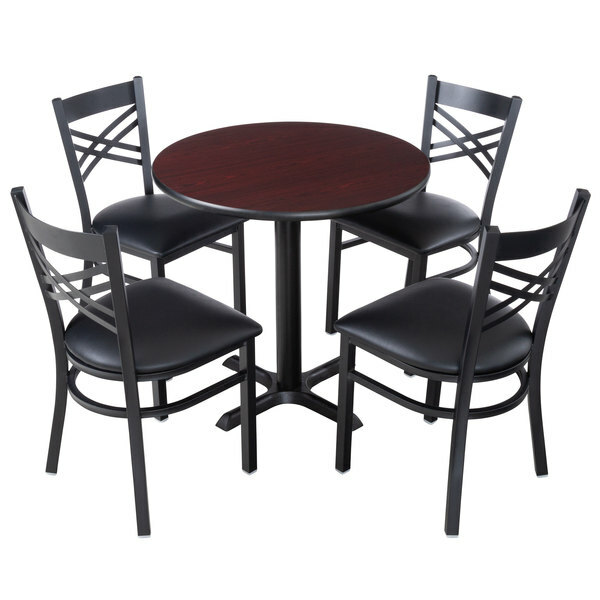 Take the guess-work out of selecting complementary tables and chairs by choosing this Lancaster Table & Seating 30" round reversible cherry / black standard height dining set! This standard height table comes complete with everything you need to quickly and easily assemble a classic 4-top table. From the strong, sturdy cast iron base plate and spider, to the sleek black column and durable laminated table top, this table is an all-in-one addition to any establishment. This table comes unassembled to save you on shipping costs. Choose from a set of four sleek black hairpin cafe chairs or cross back chairs with padded seats or versatile mahogany finish eagle back chairs with wooden or padded seats.